Decleor Aromessence Ylang Ylang Face Night Oil.BN. £49.00!! Decleor's Aromessence's are their signature products and this, the Ylang Ylang oil is their best. It is a highly concentrated blend of essential oils and is 100% natural. It smells divine. Designed to be used under a day cream it will drip feed balancing yet brightening and healing oils into the skin. Simply massage a small amount into the face and neck. As it is a vegetable based oil it will sink straight in leaving no oily residue. This is a brand new, unopened 15ml bottle without a box It would retail at £49.00!!! 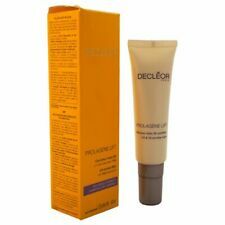 Decleor Protective Anti Wrinkle Cream 50ml SPF 50 NEW. Anti-pollution light moisturiser delivers continuous hydration. Decleor Hydra Floral Anti-Pollution is a moisturising emulsion formula that features a gradual method of hydration called ''drip-feed'' that reinforces the presence of water channels, the skin's natural moisture production system. Natural, plant-derived properties relax skin and prevent the effects of outside damage. Ideal for normal, oily or combination skin. Apply in the morning to cleansed face and neck, after Aromessence Neroli. Decleor Aroma Cleanse Youth Lotion with magnolia essential oil is ideal for mature skin. Your skin will be left feeling smooth and soft while appearing firm and toned. Paraben free. Sample size :5mlx 10 tubes. Cleanse purify and reduce excess sebum. Salon Size / not in Gift Box. Rinse thoroughly. A uniquely powerful formulation to stimulate microcirculation and deeply cleanse the skin. This revolutionary cleanser is a world-first in micellar technology and uses the powerful combination of oil and water to work deep into the pores, dissolving and dispersing dirt and impurities and removing all traces of make-up, including waterproof and long-lasting formulations. Active ingredients include Geranium to help soften the signs of ageing. Lemongrass to promote collagen production and boost firmness. Manuka to relax the skin, toning and stimulating Iris, protecting Rose, comforting Jasmine plus Plum Kernels, Hazelnut and Borage to reduce dehydration. Suitable for all skin types. Work a small amount of creamy cleanser into a lather with water. Polish off with the cleansing cloth, previously dampened with warm water. Follow with your usual lotion. Decleor Aroma 3in1 cleanser 100ml. Expect skin that is visibly smoother, softer and glowing with health. Rinse thoroughly. Rich in antioxidants, its protective formula will hydrate skin and reduce inflammation for a soothed, replenished complexion. Using a damp cotton pad, gently massage the eyes, neck and then the rest of the face in light circular movements. Apply pressure to the smile dimples (under the cheekbones) for 10 seconds. Then apply the Essential tonifying lotion. Orexcellence Energy Concentrate Youth Cream sample. Sample size :5mlx 10 tubes. Apply with a cotton pad on a clean face & neck, avoiding eye area. Leave for 5 minutes and rinse with fresh water, Due to the product being active it may cause a light temporary prickling sensation on application, To be used once or twice a week. If you fail to comply with this obligation, I may have a right of action against you for compensation. Breathe in the power of pure 1st grade essential oils to reconnect with yourself. A youthful concentrate of energy for the skin. Orders paid for by cheque will be dispatched once the cheque clears in my bank. The item is USED. Only a tiny amount has been Used! DECLEOR HYDRA FLORAL EVERFRESH 30ML. Hydra Floral Everfresh. Size :- 30ml. Decleor updated their Excellence range to much acclaim. This, the Orexcellence anti ageing eye cream, is revolutionary. The most hydrating, brightening eye cream/gel you can use which will plump up fine lines and help prevent more. Use daily This is a brand new, unopened 15ml pot without a box It would retail at £65.00!! This Christmas limited edition kit is the perfect way to discover DECLEOR’s beauty essentials. The Silent Night set is a perfect routine to cleanse, protect and illuminate your skin. Silent Night, Holy Night. Neroli: softening and hydrates. Camomile: preventive role in relation to the appearance of dark spots. This balm dissolves into the skin to comfort even the driest of skins, leaving you with a supple, soft, smooth and bright complexion when you wake up. Decleor's Aromessence's are their signature products and this, the Magnolia oil, is their newest. Replacing the old aromessence Excellence it is a highly concentrated blend of essential oils and is 100% natural. It smells divine. Designed to be used under your moisturiser it will drip feed Anti Ageing yet brightening and moisturising oils into the skin as well as dragging your moisturiser deeper than it could normally go. Simply massage 3 to 4 drops of oil into the face and neck before applying your day or night cream. As it is a vegetable based oil it will sink straight in leaving no oily residue. You can apply make up straight on top. This is a brand new, unopened 15ml professional size bottle without a box It would retail at £74..00!!! It contains Magnolia essential oil and Peony extract. 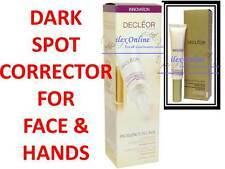 Decleor OREXCELLENCE ENERGY CONCENTRATE YOUTH FACE CREAM 50ml New! 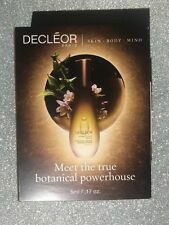 DECLEOR NIGHT ESSENCE BOXED SET ~ ANTI AGEING 30 DAY TREATMENT! ~ RRP £144!